WAIST HIGH: "A Life That Beat The Odds." "A Life That Beat The Odds." If you know me, you will know why you are reading this. WENATCHEE, Wa. - Sometimes, when he least expects it, Doug Hoxworth gets a karate attack from behind. It's swift and sure, and comes complete with a yell. But it's not such a bad thing. Carson, Hoxworth's 4-year-old grandson, is the attacker, and the boy pretty much makes Hoxworth's day. So do his granddaughters, Mackenzie and Emma. Or just a call from one of his four daughters, or a poker game with his sons-in-law. "They're all pretty much everything for me," Hoxworth says of his doting family. They're lucky to have him. Twenty-one years ago, when they were living in Seattle, Hoxworth, his family and his doctors didn't know whether he would live even another year. He was only in his mid-30s but was threatened with a deadly lung disease that only a rare operation could cure. Today, Hoxworth is believed to be the fifth-longest survivor in the world of a combined heart and lung transplant, a procedure that is rarely performed anymore. He has lived more than 20 years with the transplanted organs. At the time of his operation, only 33 other people had undergone the procedure at Stanford University in California, where he had the transplant. In the U.S., 1,092 have now had successful heart-lung transplants since the first success in 1981. The longest survivor has lived 22 years. In the early days, the heart was transplanted along with the lungs because surgeons hadn't perfected a technique for lung transplants. Today, single or double lungs are transplanted for lung disorders, and heart-lungs only for patients with failure of both organs. For Hoxworth, now 59, the journey has been both joyful and excruciating. The years since his transplant have been full of the events and memories that a tight family and many friends bring but burdened with the exhaustion and frustration that come with pain and the side effects of medication. Most recently, he is fighting kidney failure and prostate cancer. His attitude has helped immeasurably in seeing him through. "You can't dwell on it and feel sorry for yourself...You just say, 'Whatever they throw at me, I can take it,' " Hoxworth says. Transplant experts say Hoxworth has it right. They credit that outlook and self-discipline, in part, to his long survival. "You have to give a lot of credit to his desire to live and the discipline of his lifestyle. He had to comply with a difficult medication regimen," says Dr. Bill Frist, who performed Hoxworth's transplant at Stanford in 1986. He is now a senator from Tennessee and the Senate majority leader. "I don't have time to die"
Back in 1985, Hoxworth was a healthy, vigorous machinery-maintenance supervisor for a Bothell contact-lens manufacturer when he suddenly began tiring easily and having trouble breathing. He was diagnosed with primary pulmonary hypertension, in which arteries that carry blood from the heart to the lungs narrow, eventually crippling the heart. There is no known cause for the form of the disease he had. Doctors told him he probably had less than a year to live. A transplant was the only possible cure, they said. But a Seattle cardiologist didn't encourage the surgery because it had limited success. With little hope, Hoxworth and his family decided to take a last trip together to California. Along the way, his youngest daughter, Katy, then a gregarious 4-year-old, struck up a conversation with a woman beside a Disneyland hotel pool. The woman turned out to be the wife of a doctor - an expert on pulmonary hypertension. Within 15 minutes, the doctor was talking to Hoxworth and offering help. Soon he had Hoxworth try a drug he was researching, but it didn't help. So the doctor got him on the waiting list for the transplant at Stanford, the closest medical center to Seattle that was then performing the procedure. Hoxworth and his family moved to a small house in Sunnyvale, Calif., near Stanford, and waited for a donor. For eight months. "I don't have time to die," he said in a 1985 interview with The Seattle Times. "I've got too many things left undone...and I've got a lot of fishing I want to do." Two potential donors came up. One turned out to have a lung infection. For the second, Hoxworth had a cold and couldn't have the operation. Finally, on May 14, 1986, at age 38, he received the heart and lungs of 18-year-old Michael Fencl, who had died in a motorcycle accident. Looking back, Frist and Dr. Bruce Reitz, who performed the world's first successful heart-lung transplant at Stanford in 1981, said several factors contributed to Hoxworth's long survival: the young age of the donor, Hoxworth's relative youth at the time and a good tissue match. And his medications have been essential. Hoxworth figures he has been on 40 different drugs over the years. They have included several drugs to prevent his body from rejecting the transplanted organs, plus others to fight infections, thyroid problems, depression, acid reflux and a variety of other problems. Now he takes medications to fight prostate cancer and kidney failure. "Sometimes I take one to counteract the side effects of the other to counteract the side effects of the other," he says, with only a slight chuckle. The drugs have also been the major factor contributing to his kidney failure. Prednisone, a powerful steroid to prevent rejection, has been the hardest to handle, he says. Side effects have included memory loss, blurry vision and moods that swing from quick temper to getting weepy over a simple phone chat with a loved one. He was never able to return to work. Family has been key to Hoxworth's coping, he says. Wife Susan's support through the ups and downs has been unwavering. She has overseen his medications, understood his condition, fended off his anger. "Susan is my lifeline," Hoxworth says. Soon after the transplant, Susan took a job as an assistant in a Wenatchee dental office to help support the family of four daughters beyond Social Security and disability payments. As he recovered, Doug found his parental role increasing. He drove his children to their activities and helped negotiate their teen years. One of his fondest memories is playing golf with a 10-year-old Katy, who showed natural talent. After a round they would go out for lunch and chat and laugh together. "No matter how he feels, he doesn't complain," says Katy Boreson, now 26. Her experiences with her father helped her decide to become an intensive-care nurse at a Seattle hospital. His other daughters also marvel at how their dad has held up and made the best of the hand he was dealt. "He shouldn't be here, but he is," says his second daughter, Mary Gatewood, now a 34-year-old marketing specialist for a medical-device manufacturer in Kirkland. "Stubbornness can be a good thing. We don't give enough credit to what our minds can do." Hoxworth says his ability to keep his problems in perspective has helped keep him going. The small stuff, he says - a stubborn car engine or running late to an appointment - fades like the wind. Even the big problems - his recent life-threatening illnesses or the family's current financial troubles - he mentally puts aside. He'd rather live in the present. At the same time, though, setting goals has been vital. First, it was living to see all his daughters graduate from high school. Then it was college. Then it was to see how they turned out as adults. Now he's shooting to make his 60th birthday in May. The Hoxworths knew several other transplant candidates who never made it. Doug Hoxworth calls his transplant "the luck of the draw," but he has been an exceptionally conscientious patient in taking care of himself, his wife says. And then there's Michael Fencl. Hoxworth was not told by doctors who his donor had been. But one of Fencl's friends knew he had been an organ donor, and she attended the same California high school as Hoxworth's daughter Lisa. 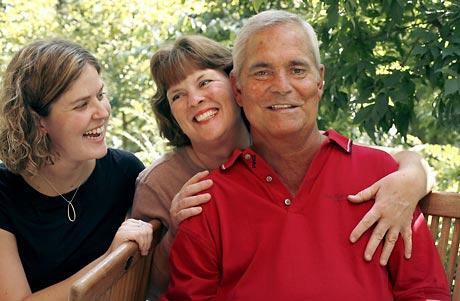 The friend told Lisa she knew the identity of her dad's donor. The Hoxworths arranged through a television crew doing a documentary on transplants to meet Fencl's mother. The family still remains close to his mother. "I think about him all the time," Hoxworth says. "I talk to him. I say, 'Thank you, Michael.' "
If you don't know me, Michael Fencl was my friend.